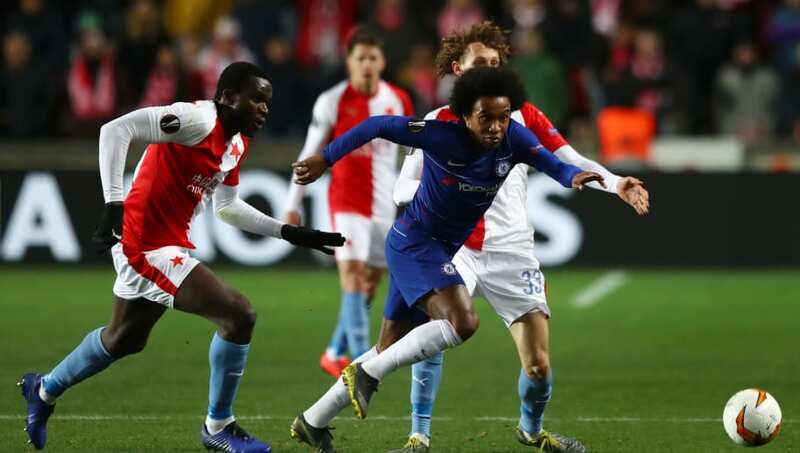 ​Chelsea will look to book their place in the Europa League semi-final on Thursday, as they welcome Slavia Prague to Stamford Bridge for the second leg of this quarter final tie. A positive result for Maurizio Sarri would send ​Chelsea through to the last four where they would face either Benfica or Eintracht Frankfurt, with lifting the Europa League beginning to look like their most likely route to playing Champions League football next season. ​Antonio Rudiger was forced off before half-time against ​Liverpool after sustaining a knee injury, and although the extent of the blow is not yet known, it is highly unlikely that the German centre-back will be available for Thursday. Andreas Christensen, or even the forgotten man ​Gary Cahill, should line up alongside ​David Luiz at the heart of the Blues' defence, with ​Marcos Alonso in contention to return to the squad after missing the trip to Anfield with a thigh problem. Sarri continues to carefully manage the fitness of ​Ruben Loftus-Cheek and after playing 75 minutes on Sunday, Blues fans might expect to see ​Ross Barkley in the starting lineup against Slavia Prague. Chelsea should need no extra motivation on Thursday, knowing ​Arsenal hold all the cards in the race for a top four Premier League finish - as well as knowing they have a trip to Old Trafford coming up.